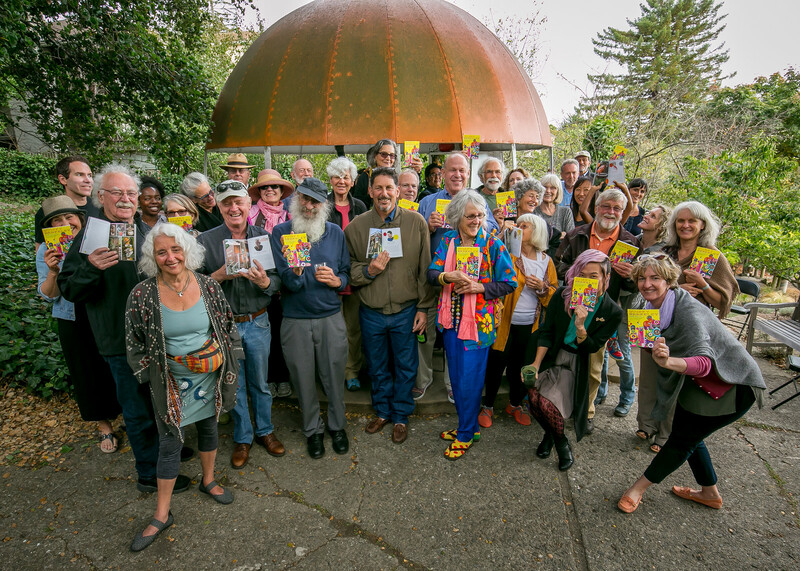 Quirky Berkeley | Quirky Berkeley – the book – is here now! 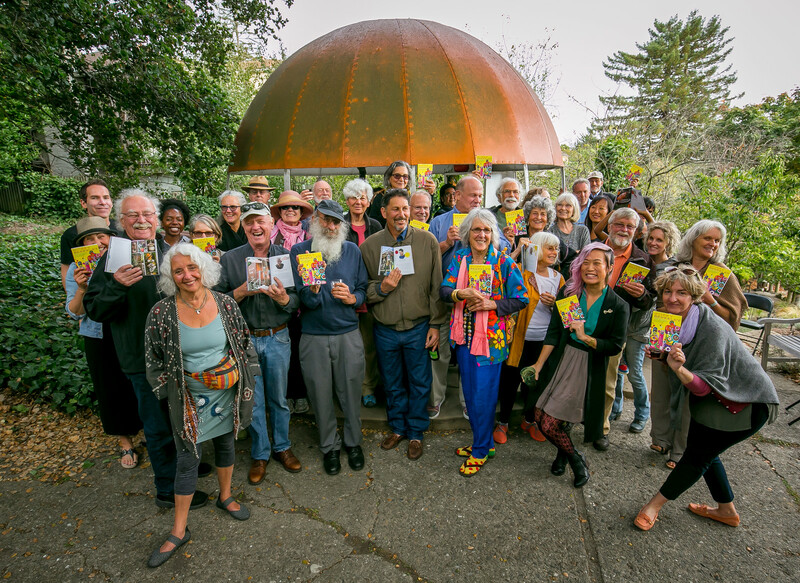 Quirky Berkeley – the book – is here now! It’s true! It’s here. 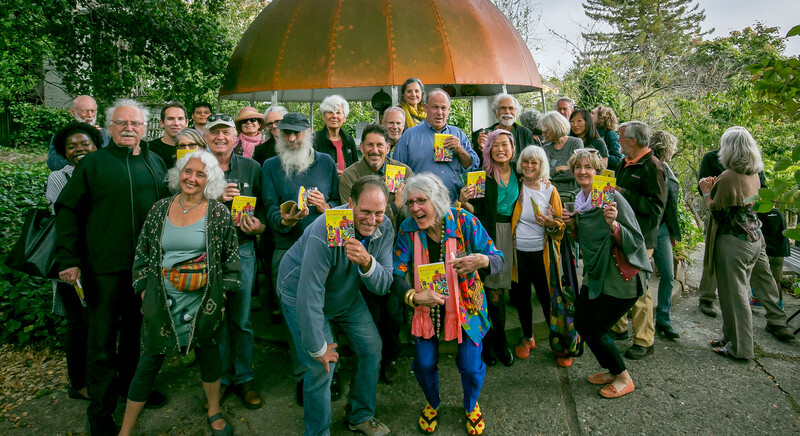 Berkeley’s crown jewel Heyday Books, an independent nonprofit publisher, has published the first volume of Quirky Berkeley. It features the photographs of John Storey (on the left), drawings by Traci Hui (center), and writing by yours truly (on the right). This photo is from the launch party at the north branch of the library on August 1, 2016. John has taken many of the really good photos that I have used in my blog. Traci has been in the inner circle of Quirky Berkeley for a few years. I was lucky to catch her between a layoff and a rehire when she had time to make drawings of the artists featured in the book. They rock! The book alternates between “major manifestations” such as the Tssui Fish House on Mathews Street (single-location, major quirky) and “aggregations” such as bowling balls used for lawn art (multiple location, same theme). You can buy it at most Berkeley bookstores. 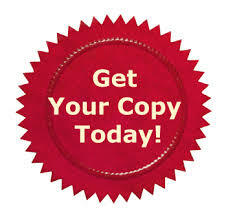 Or online from Barnes & Noble. I will advertise book events as they approach. 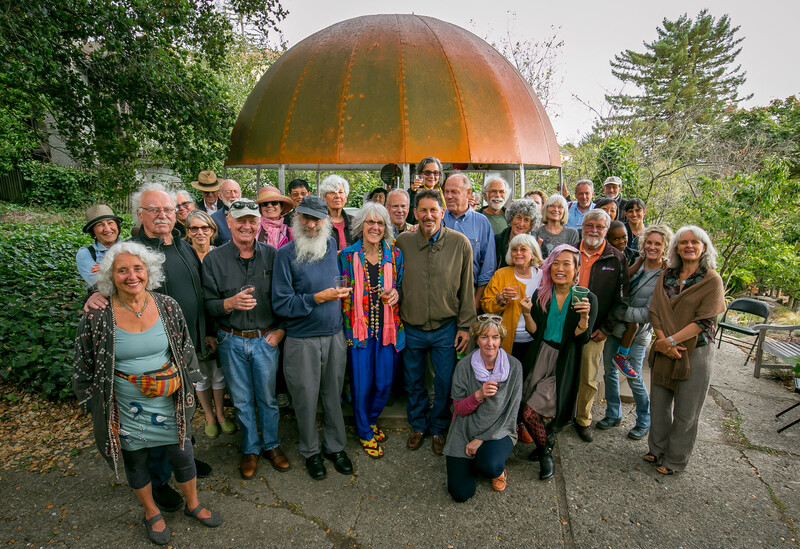 Frances Dinkelspiel and Tracey Taylor of Berkeleyside have been strong supporters of my Quirky Berkeley quest. Frances wrote a flattering portrait of me (IT’S ALL ABOUT ME!) for Berkeleyside on August 1. She also took this photo – at the Homemade Cafe on Sacramento at Dwight, my go-to-breakfast spot since 1981. Four generations of my family have eaten here! 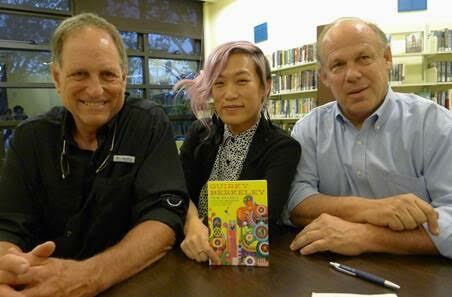 I mentioned in passing the event at the library on August 1. It was organized by Jack Baur and it was a smash! There were almost 100 people lined up waiting for the doors to open at 7:00 p.m. Almost tout le monde was there. 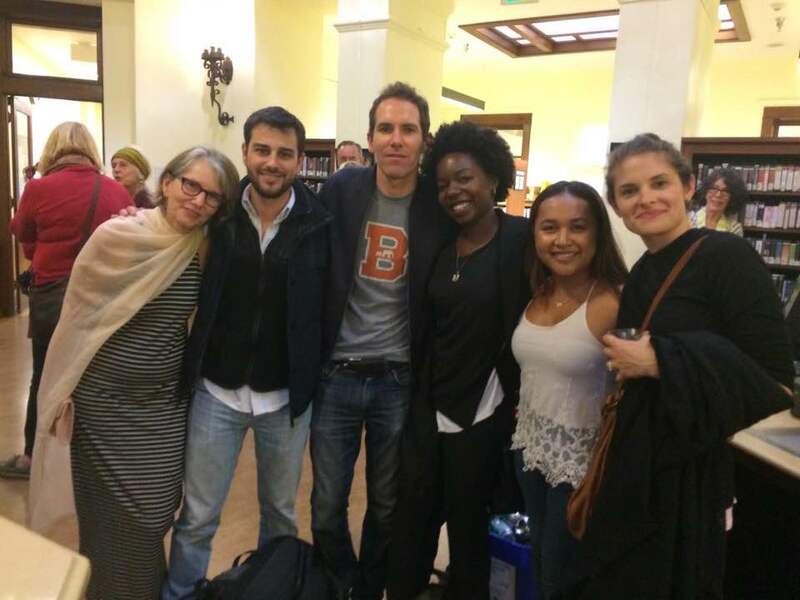 Left to right: my partner Catherine MacNeal, my son-in-law Jay Firestone, my son Jake Foster, his fiancee Sandile Hlatshwayo, my daughter Rosalie MacNeal, and my daughter Julia Dalzell Firestone. Youngest daughter Charlotte MacNeal was in the house but not in the photo. 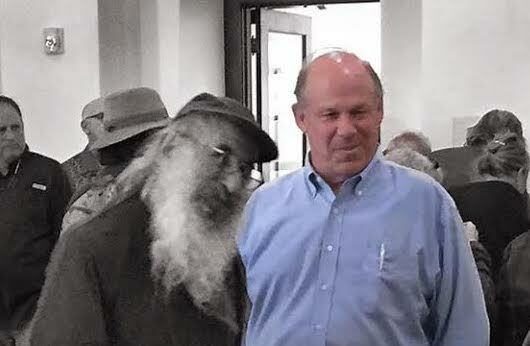 Craig Bryar made this photo of Malcolm Margolin and me. Ha! John Storey is on the far left. Kind of a Wizard of Oz thing going on here with the B&W and color. 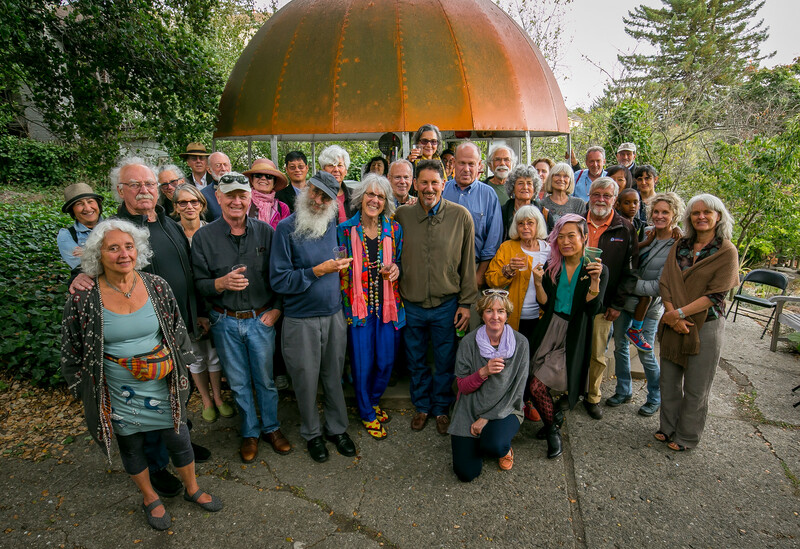 On August 5th we had a smaller launch event for the artists, Heyday, BAHA, Berkeleyside, and the Berkeley Historical Plaque Project. 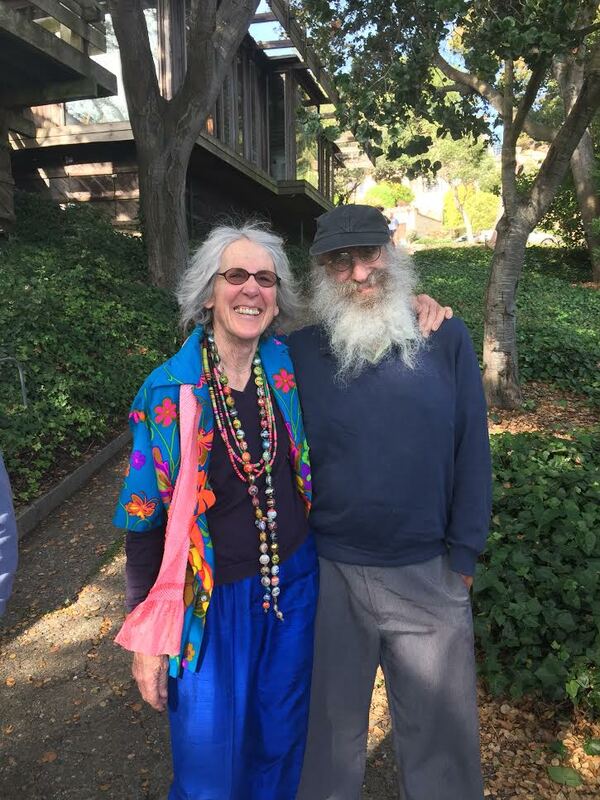 Here Marcia Donahue, the spiritual center of Quirky Berkeley, stands with Malcolm Margolin. This is our version of “A Great Day in Harlem,” the iconic black and white photograph taken by Art Kane on August 12, 1958, of 57 jazz musicians in front of a Harlem brownstone. Or – it is a photograph of many members of the tribe. How fun is this! A book. All these refugees from the rational culture. Berkeley! 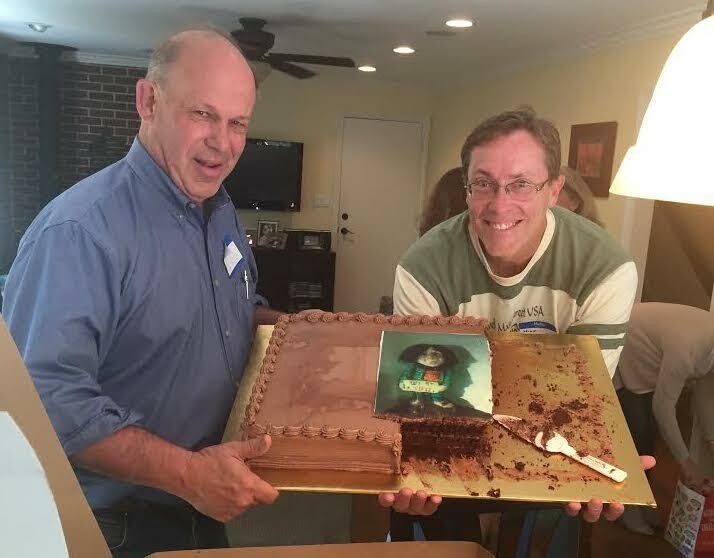 I brought a Virginia Bakery cake with an image of my friend (see below) embossed in the frosting for the event at the orange. I took the leftovers to a house meeting the next day for families about to host a foreign exchange student. When I introduced myself to the group, a man asked if I was the Quirky Berkeley guy. I said yes. He told the group that I was famous in Berkeley. Ha! The man was Berkeley Police Chief Mike Meehan. 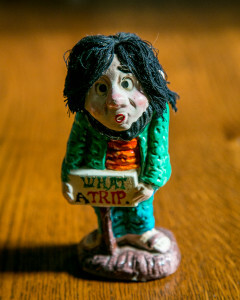 Chief Meehan rocks with Quirky Berkeley! 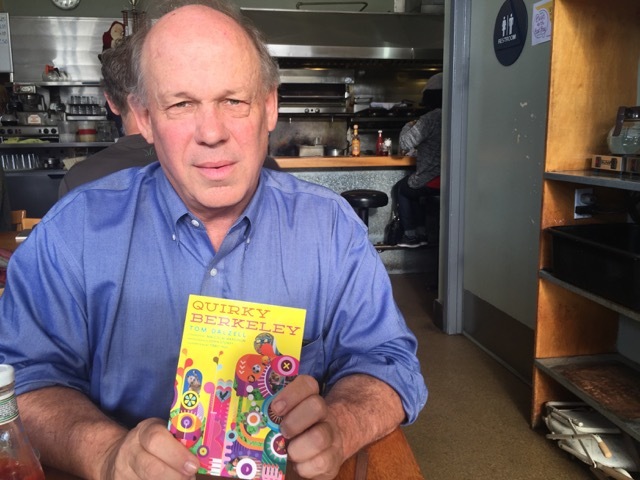 The publication of Quirky Berkeley comes in the week in which I learned that one of my mentors, Robert Regan, died in July. 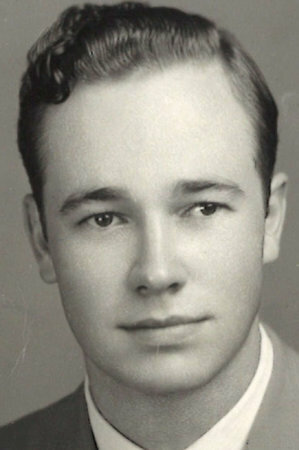 This photograph of a young Bob Regan was printed with his obituary. This photo is from my last visit with him, in 2015. 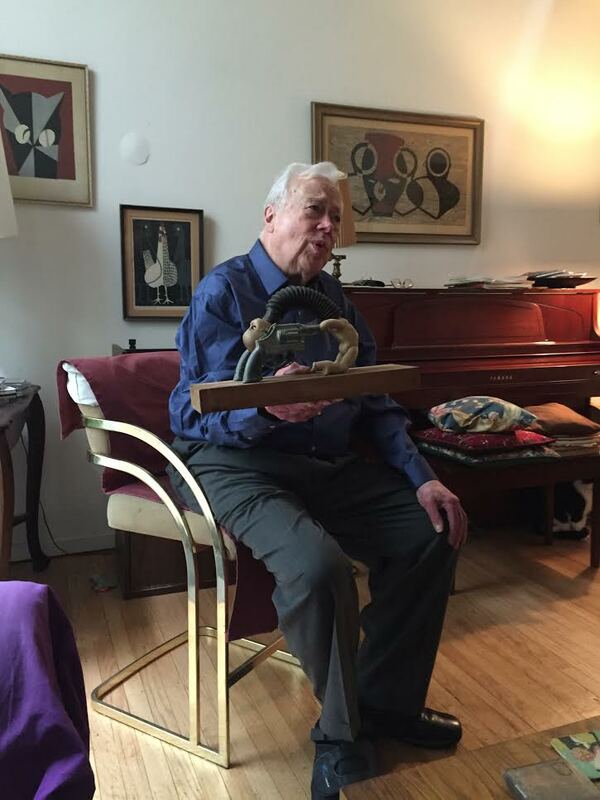 He is holding a sculpture that he bought while in Berkeley in the early 1960s. Dr. Regan taught English at the University of Pennsylvania. He gave me a lifelong love of American literature – the Transcendentalists, Poe, Twain, Howells, the dialect authors, Crane, Whitman, Dickinson. He embraced Kerouac whom we all loved to death. I had the chance in 2014 and again in 2015 to see him and tell him how much he had inspired me. He had followed my union and slang careers and was proud. What a king he was! He gave me a copy of A Mark Twain Lexicon when I saw him in 2015. I had it rebound and it is two feet to my right as I type this. I will still see him and hear him. My friend’s photo is in the book, page 95. He is a proud man about that. What does he think about the book? 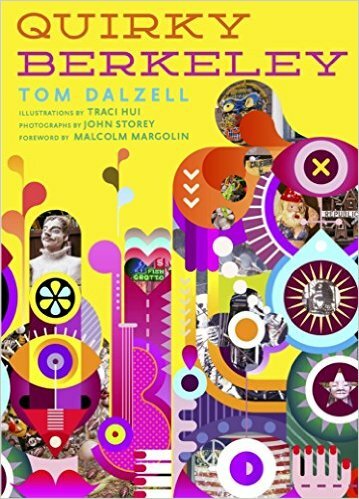 2 Responses to Quirky Berkeley – the book – is here now! Tom, you rock! The forward by Malcolm Margolin and your introduction to THE book express better than anything I’ve ever read about what it means to be the outsider who found home in Berkeley. This is no novelty book.